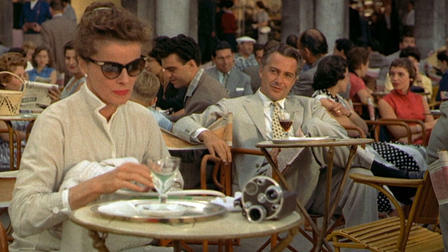 SUMMERTIME might not be the optimum season to visit Venice, as love-starved Katherine Hepburn does in this beauty-drenched 1955 romantic drama. Head there in spring or fall to escape crowds, pollution and maybe some smells. Other advice is that anytime is good for watching this valentine to the Queen of the Adriatic. Adapted from a play starring Shirley Booth, it was a hot property shopped around for assorted talent to haggle over, and director David Lean went through several writers before settling on H.E. Bates to help him put his vision of the story onto locations all over the Italian jewel. 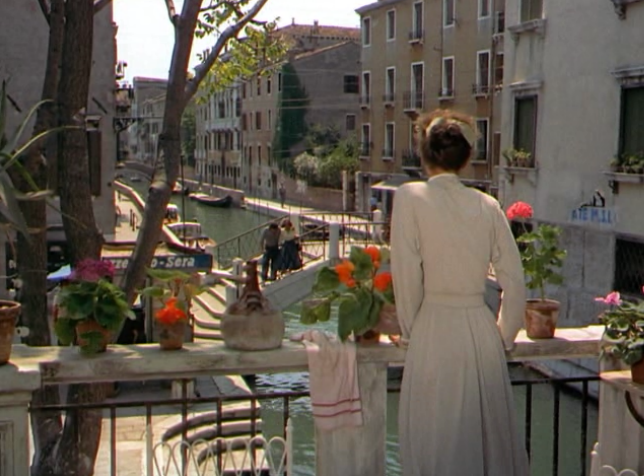 The story is touching, the acting’s great, but the real affair is Lean’s visual infatuation with Venice. It was his favorite city, and he took great pains, with great cameraman Jack Hildyard, not to merely repeat post card views, but to shoot around the expected famous sites from a variety of naturally occurring angles, mixing long shots and closeups of his actors in organic composition with the settings, so you felt like you were there with them in the alleys, at the cafes, on the bridges, yet weren’t distracted from the storyline by the views. 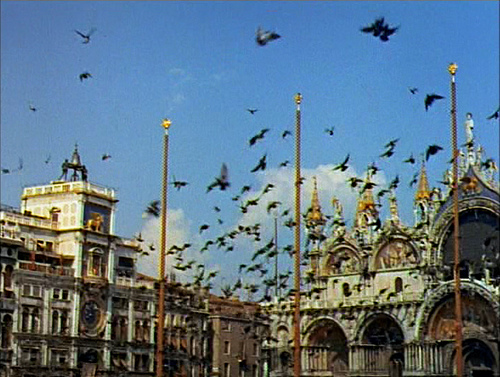 He does go to town with dazzler shots of Murano, fetching enough to make you want to eject the DVD and buy a plane ticket. 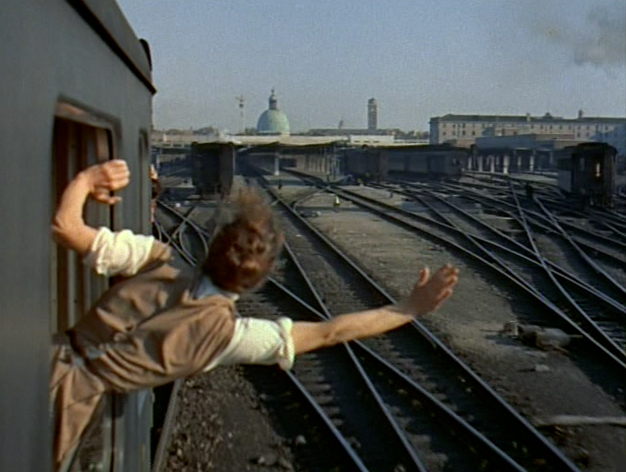 One problem he faced shooting the film was with shopkeepers who’d make a ruckus disrupting shots because they felt the crew was driving away customers: they essentially blackmailed the production company to pay up and cover their perceived losses so they’d behave. The spirited Brahmin-bohemian Hepburn was Lean’s favorite actress (he didn’t cotton much to performers, men or women) and they became soul mate pals. He didn’t attempt to charm her into becoming one of his six wives: just as well, as being a partner to Lean was an emotionally grueling rollercoaster that generally came to a never-look-back Full Stop. They both drew Academy nominations for their work here; Lean’s third, Hepburn’s sixth. Brazzi was on a roll, basically holding down the Italian Front single-handed for the International Leading Man category, bracketing this hit with Three Coins In The Fountain and South Pacific. 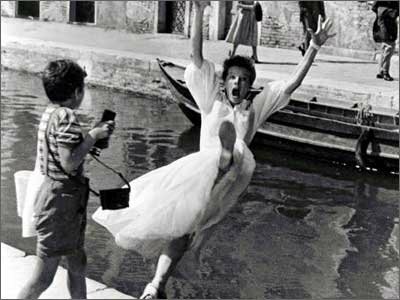 Kate’s famous fall into a canal was always rumored to have resulted in an eye infection that caused her problems ever-after, but she regularly took evening swims in the waterways. Her quote on the subject: “I am a fool”. The 100 minute charmer features Isa Miranda, Darren McGavin, and Mari Aldon. Gaetano Aldiero is the kid whose quick-thinking grabs Kate’s camera before she topples into the drink. The last shot is a famous tear-jerker. absolutely love this movie. stood at the place Hepburn fell into the canal and pretended to fall. would not want to actually get into that water.